A mysterious Golden Pyramid is discovered, loaded with ancient treasure. 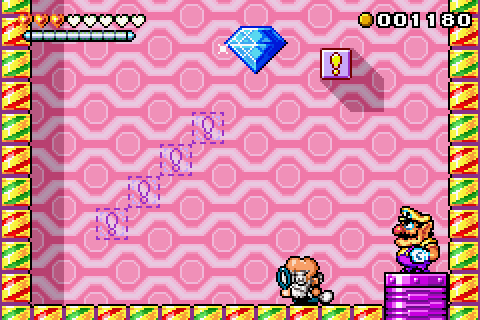 Wario heads in, ready to steal as much of the treasure as he can, but he falls deep inside the pyramid where he finds many portals to other worlds. In each level you have to find Keyser, then trigger the switch to open the exit portal. The switch also activates a time bomb, so Wario has to race to the portal before time is up. Each level also has four puzzle pieces that open the boss chamber and a hidden CD to collect. Play minigames to earn medals and use them to buy weapons to fight the bosses. Clear all four bosses to open the final challenge. During the battle with Spoiled Rotten, in the background you can see a TV set with two GameCubes on top. One of facing forward and one is showing the top. 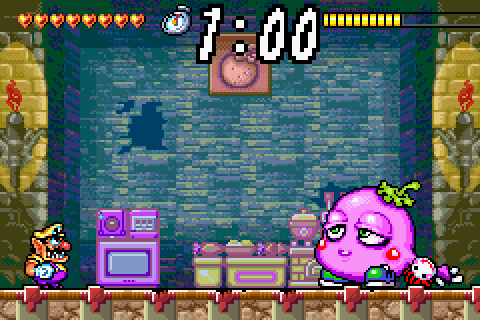 In Japan, this game was released before the launch of the GameCube, making this a pre-release cameo. The old, bearded professor who appears in the bonus rooms and the Wario Hop minigame is Dr. Arewo Shitain from For the Frog the Bell Tolls. He was the head scientist who worked in the Nantendo building. 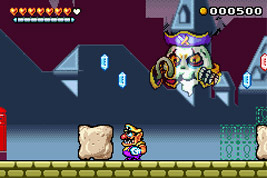 In Wario Land 4 you can throw him around, and he can also sometimes be seen playing a Game Boy Advance. The same character designer, Tomoyoshi Yamane, worked on both games. During the ending, one of the treasures that pops out of the bag is a golden Game Boy Advance. The respective background art also shows Wario with a lot Game Boy Advances.